It is not clear when or where sheep were first domesticated. but the ancient association between man and sheep is reflected in the untold numbers of breeds, crosses and varieties found throughout the world today. Most of these breeds are of purely local importance, and their numbers are rapidly dwindling as the demands of a technological society, supported by worldwide educational agencies, computes controlled breeding programmes, and modern transportation replace the needs of older, more isolated societies. Throughout Asia and North Africa there are numerous breeds of sheep specially suited to life in dry desert climates. Some varieties possess practically no wool, while others may be covered in long, coarse wool which helps to protect the animals from the heat of the summer sun. Many breeds have a property similar to that of the camel. They are able to store food as surplus fat, deposited in a limited number of body areas. While the camel carries its fat store on its back, the desert sheep does so either on its rump or on its tail. Both fat-rumped and fat-tailed breeds of Eastern sheep can be seen in the deserts of Abu Dhabi. Most of the local varieties of sheep may not meet the needs of modern society. Cows produce more milk. Nylon and polyester can be manufactured and worked with greater ease than hide or wool. The uneven depositions of fat within the body produces poor quality mutton that requires a lot of trimming before it is ready for the supermarket. At present it is cheaper to import mutton into Abu Dhabi. Black-Head Persian sheep may be seen scavenging around Bedouin tents and villages in some of the more isolated areas of the Abu Dhabi deserts. As the picture shows, the name is a purely descriptive one. This breed has a glossy black head and neck which contrasts strongly with a white body almost devoid of wool. This is a mutton sheep, but since it possesses light shoulders and an oily meat, it seldom finds its way into the European market. 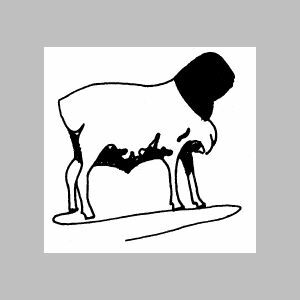 Improved carcass quality has been achieved by crossing the Black Head Persian with various English mutton breeds, a process that has also led to an earlier development of the lamb. Some sixty years ago a North African ship called at a South African port with a cargo of sheep. The Black-Head Persians were spotted by some local farmers who, liking their appearance, bought some. By chance it was discovered that this breed remained healthy in certain areas where the famous wool-bearing Merinos were suffering from disease. Since then breeding and selection have improved the stock to such an extent that it is now recognized as a standardized breed in Southern Africa. 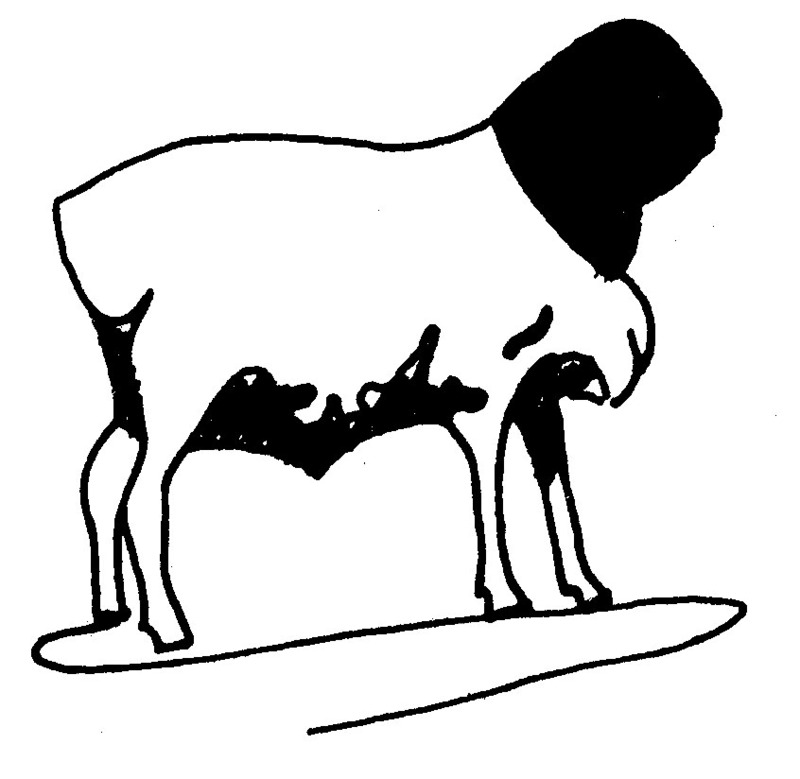 Attempts to cross the Black-Head Persian with the Merino have only produced sheep bearing inferior wool. However, Black-Head Persian ewes reared for the production of Persian lambskins have been upgraded with pure-bred Karakul rams. In 1950 the Dorper Breed Association came into being, when the Dorper was recognized as a specific breed. This breed contains an equal proportion of Dorset Horn and Black Head Persian. The characteristic black head and white body has been retained, as has disease resistance, yet the large fat deposits on the rump and under the tail have diminished considerably. The Dorper is still suited to living in arid areas and, since it has a more rapid growth rate and superior mutton quality, it is now replacing its parent breeds in many parts of the world. Fraser, A. and Stamp, J. J. (1968) Sheep Husbandry and Diseases, Crosby Lockwood.